From the magical icescapes of Greenland to a moonlit Venetian sea, top UK filmmakers' work provides a visual feast to each mesmerising composition. The music twists and turns taking the audience on a continuous journey of intense emotion to chair-gripping drama. Recent sellout dates include the Royal Pavilion, Duke of York's cinema, Komedia and headline concerts at the Brighton Fringe, Arundel festival, Hurst festival, playing to an audience of 1000 at the Royal Academy. Their audience feedback on their press page says it all. See the trailer above for a preview. This year, their new show TIMESCAPE comes to the Brighton Fringe (14th May), Hurst Festival (September) and the Komedia in Brighton (December). Box office details coming soon. 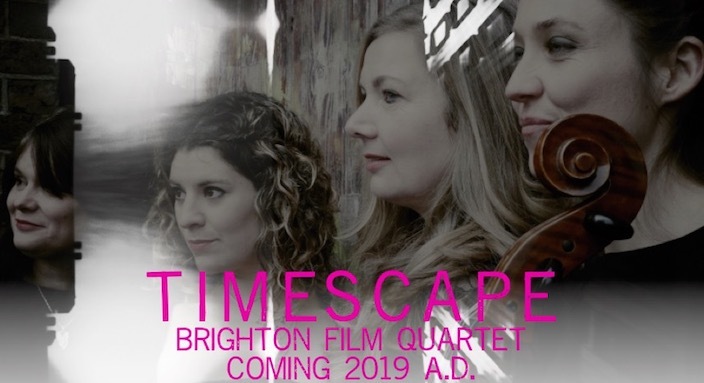 Last year, the Brighton Film Quartet play at the International Composers Festival with the soul-stirring music of their composer-pianist Penny Loosemore. Come and hear them at the iconic De La Warr Pavilion, Bexhill. As well as the Quartet's mesmerising blend of minimalist cinematic music set to big-screen visuals and ambient soundtrack, the work of 50 composers from around the world was showcased. See our Composeress page for more music and info on these amazinge 10 extraordinary female composers who featured.